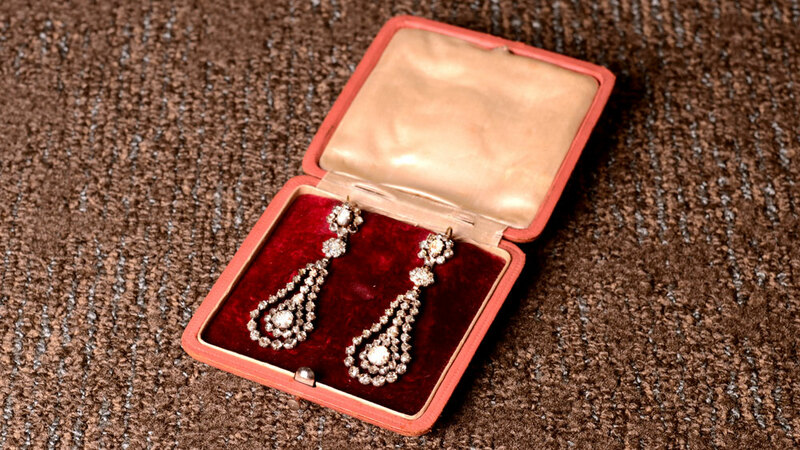 What is the difference between Antique Jewelry and Vintage Jewelry? What is the difference between antique and vintage? 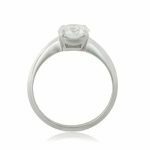 What is the difference between an Antique Engagement Ring and a Vintage Engagement Ring? 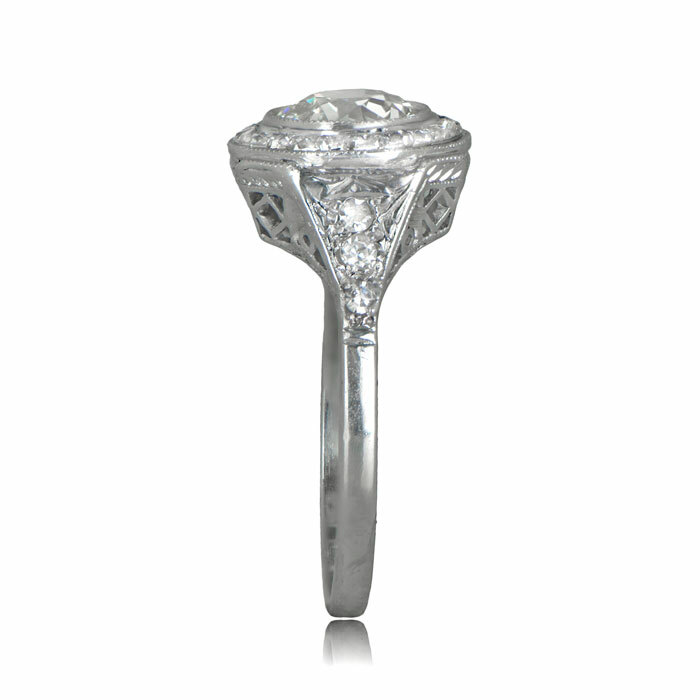 Or how about an Estate Ring? These are all very common questions. The terms are so often intertwined that more often than not we find people using the terms completely incorrectly. Here is the general rule to remember: Something antique is also vintage, but something vintage isn’t necessarily antique. Vintage refers to something that is from an earlier generation. Antique refers to something that is over 100 years old. Vintage jewelry typically refers to jewelry made after the 1930’s and includes the Retro Era, Hollywood-inspired 1940’s jewelry, the Jacqueline Kennedy inspired 60’s jewelry, and even the dramatic jewelry of the 70’s and 80’s. The word antique denotes an item that is over 100 years old. Antique engagement rings and antique jewelry will be from the Georgian Era, Victorian Era, Edwardian Era, or Art Deco Era. The term estate refers to an item that was previously owned. Usually, this refers to antique jewelry, but it is possible (and also correct) to use it to refer to vintage jewelry. The fourth category is Period Jewelry. Period jewelry includes Victorian-Style, Edwardian-Style, and Art-Deco-Style. 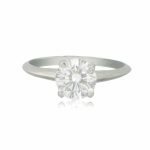 The jewelry in this category comprises of antique diamonds (like the Old Mine Diamond or Old European Diamond) and reset in a platinum or gold setting that borrows influence in design from one of the aforementioned eras. The terms and dates below are correct as of the year 2018. Vintage Jewelry: Jewelry made prior to 1999. Estate Jewelry: Jewelry that is not brand new. Estate can also be vintage or antique. This ring shown above is from circa 1910. 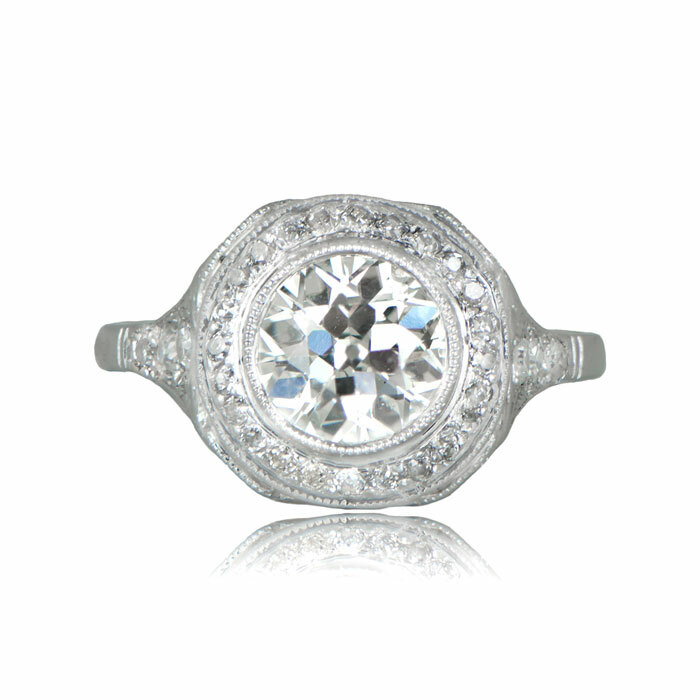 It was purchased by Estate Diamond Jewelry from an estate and listed on our website. This ring is a good example of a ring that would be antique because it is 108 years old. In addition to being antique, it is also vintage and estate. It is also over 20 years old and so it is vintage. Due to the fact that it is second hand, it is also an estate jewelry piece. Click here to view more information about this antique ring. The ring shown above is from the 1950’s. A lady wore this ring for over 50 years before her estate sold it to us. This ring is vintage and estate, but would not be antique. It is vintage because it is over 20 years old. The ring is considered estate because it was purchased from someone who used it. It is not called antique because it is not over 100 years old. 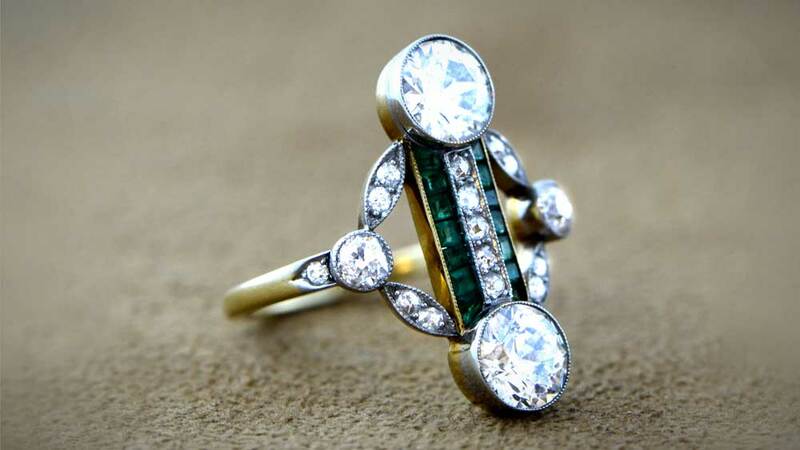 Click here to view more about this vintage ring. This ring was made circa 2000 and was sold to Estate Diamond Jewelry through our sell your jewelry page. This ring is estate jewelry. It is not vintage or antique because it is only 18 years old. More information on this estate ring is visible here. 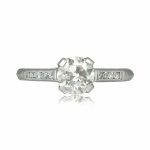 When making a purchase of a piece of jewelry, understanding the difference can potentially save you a lot of money. Knowing the difference between these terms will help you decipher much of the information on the web. Age is very important to those who love vintage jewelry and these terms are their building blocks. Knowing the definitions will also give you a tremendous edge as a buyer. If you see the terms used incorrectly, it is a great warning that something is amiss. Vintage jewelry buying hinges strongly on trust and education. If something is missing with a jewelers education, you may need to start doubting the trustworthiness of the jewelry piece. Please note: If a jewelry seller calls an 80-year-old ring as “antique”, don’t worry. 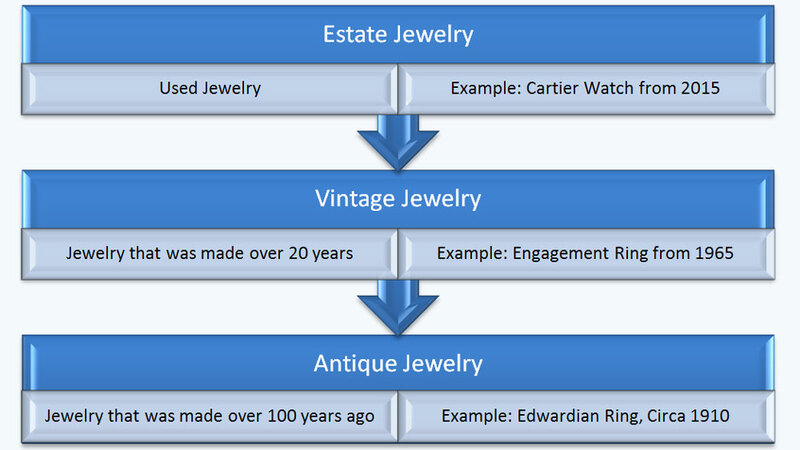 As mentioned earlier, in the jewelry trade anything over 80 years will be labeled as antique. If, however, your seller calls something “estate” as “antique” I would start to worry. 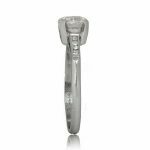 Jewelry definitions are also important because it will build your confidence as a buyer. Arming yourself with knowledge is the greatest way to buy effectively. Learn and memorize all the common jewelry terminology before you go shopping. You will save so much money and you will also be able to make your purchase with so much more conviction. What did you think the difference between antique and vintage was before you read this article? Tell us in the comments below!